Four novellas, a short one, two new adults and 3 full novels made for quite a full week! It also helped having a snow day! You certainly achieved a lot of reading. I am looking forward to reading Four Friends, intend getting to it next week. Love Robyn Carr's work. 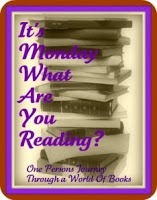 Have a good week and enjoy all your reads. Wow! Great reading week. I hope this one is as wonderful.